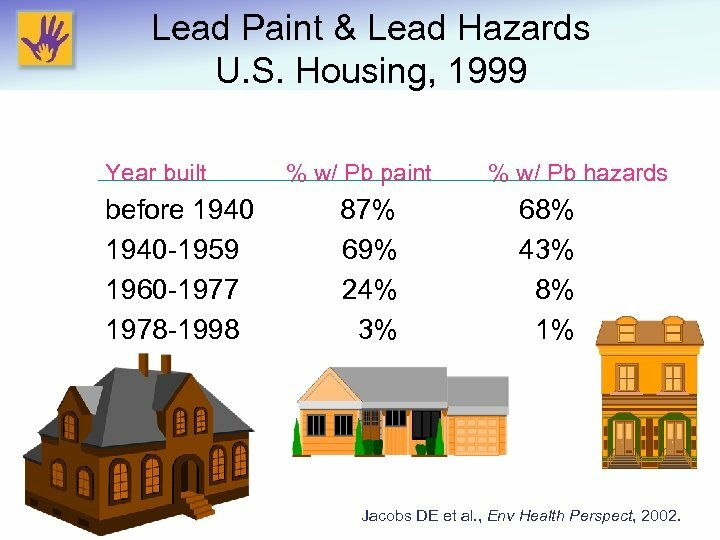 Lead Paint & Lead Hazards U. S. Housing, 1999 Year built before 1940 -1959 1960 -1977 1978 -1998 % w/ Pb paint 87% 69% 24% 3% % w/ Pb hazards 68% 43% 8% 1% Jacobs DE et al. 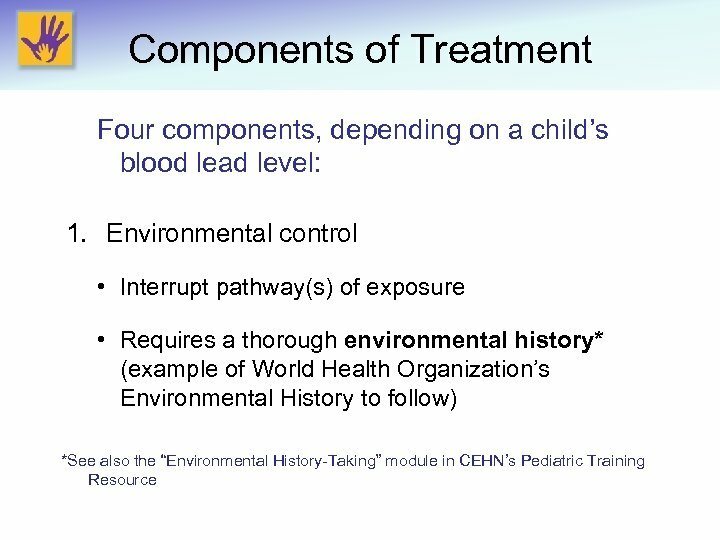 , Env Health Perspect, 2002. 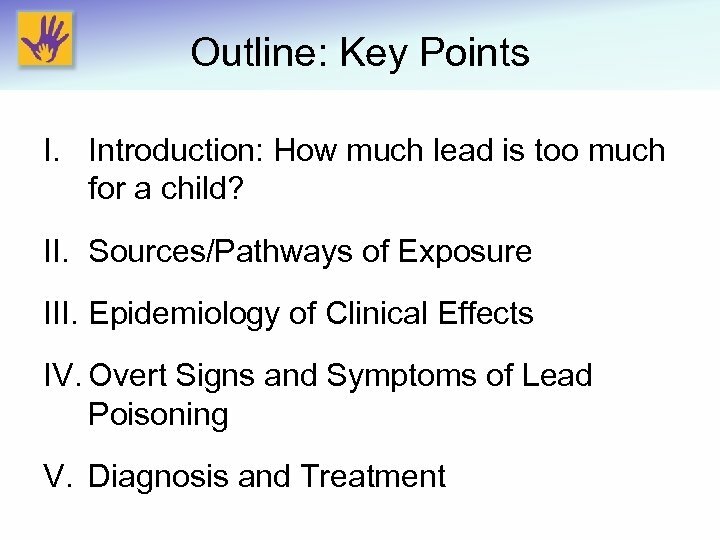 Sources of Child’s Exposures to Lead Childhood Lead Poisoning, WHO, 2010. 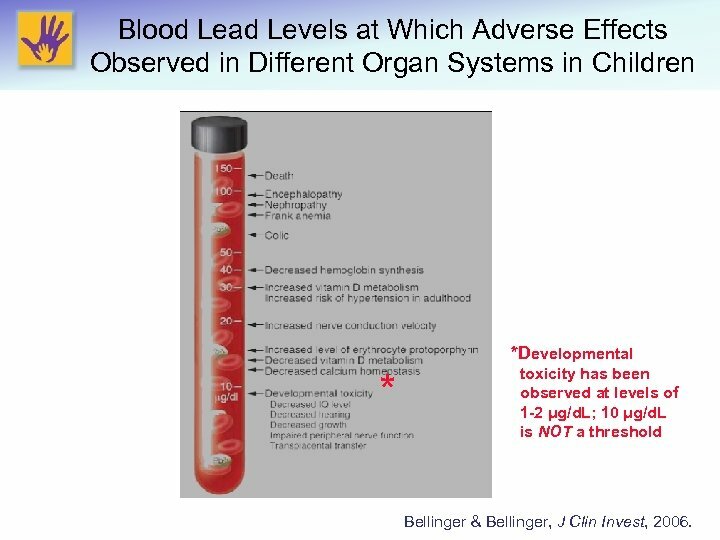 Blood Lead Levels at Which Adverse Effects Observed in Different Organ Systems in Children *Developmental * toxicity has been observed at levels of 1 -2 μg/d. 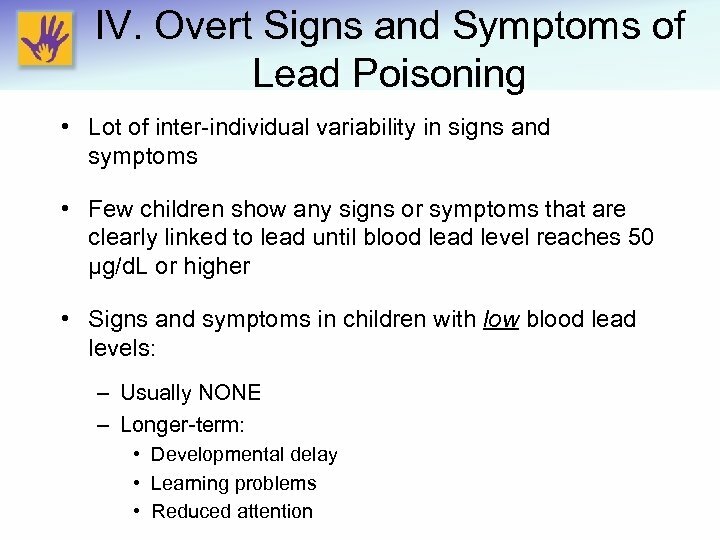 L; 10 μg/d. 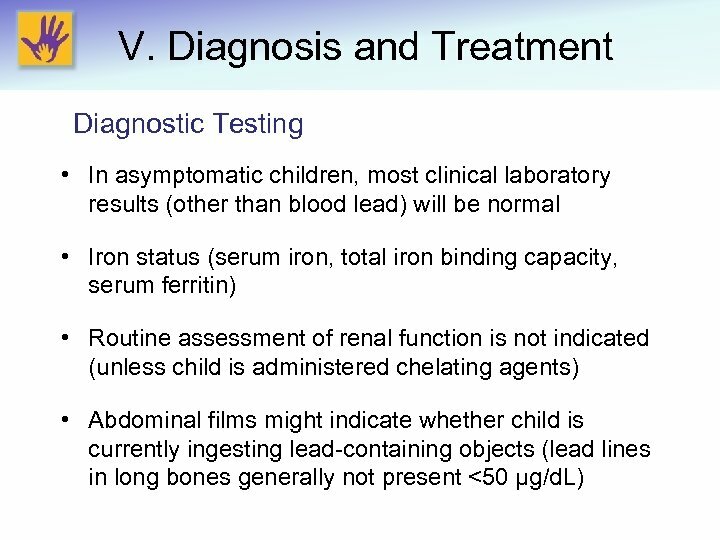 L is NOT a threshold Bellinger & Bellinger, J Clin Invest, 2006. 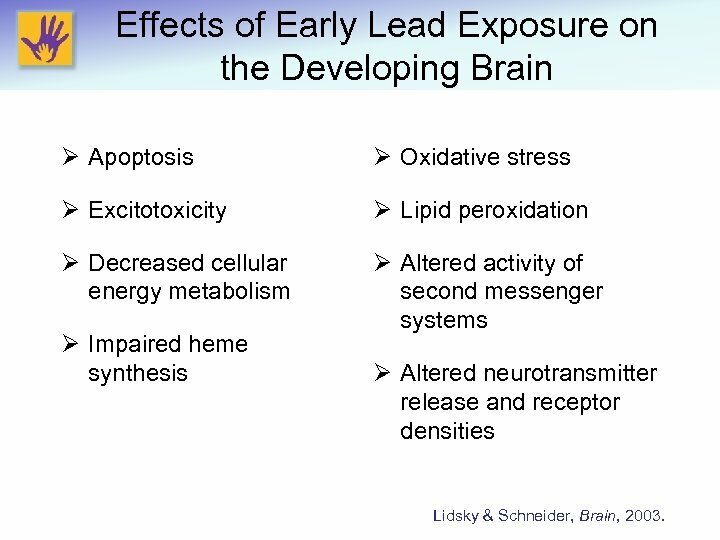 Effects of Early Lead Exposure on the Developing Brain Ø Apoptosis Ø Oxidative stress Ø Excitotoxicity Ø Lipid peroxidation Ø Decreased cellular energy metabolism Ø Altered activity of second messenger systems Ø Impaired heme synthesis Ø Altered neurotransmitter release and receptor densities Lidsky & Schneider, Brain, 2003. 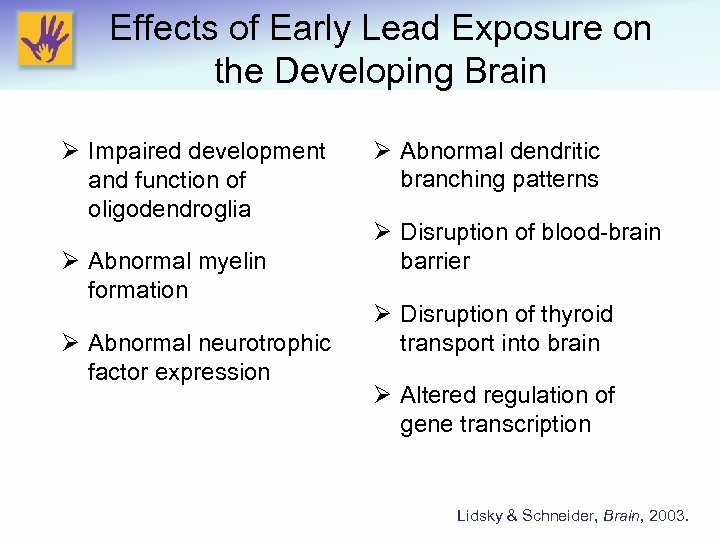 Effects of Early Lead Exposure on the Developing Brain Ø Impaired development and function of oligodendroglia Ø Abnormal myelin formation Ø Abnormal neurotrophic factor expression Ø Abnormal dendritic branching patterns Ø Disruption of blood-brain barrier Ø Disruption of thyroid transport into brain Ø Altered regulation of gene transcription Lidsky & Schneider, Brain, 2003. 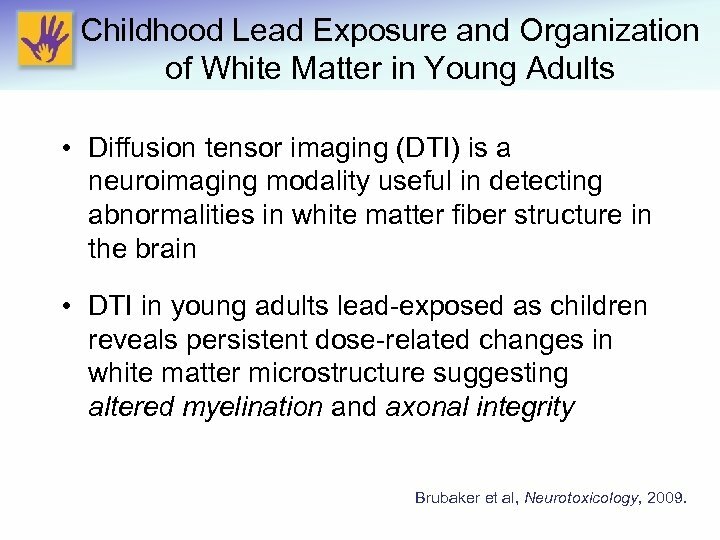 Childhood Lead Exposure and Organization of White Matter in Young Adults • Diffusion tensor imaging (DTI) is a neuroimaging modality useful in detecting abnormalities in white matter fiber structure in the brain • DTI in young adults lead-exposed as children reveals persistent dose-related changes in white matter microstructure suggesting altered myelination and axonal integrity Brubaker et al, Neurotoxicology, 2009. 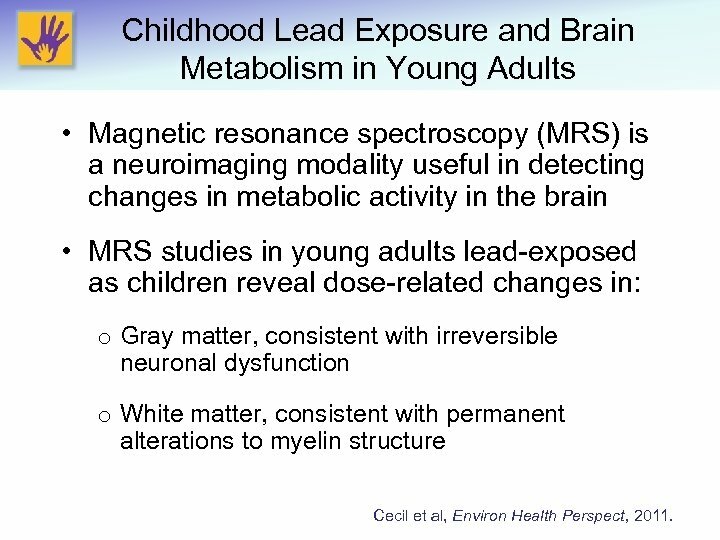 Childhood Lead Exposure and Brain Metabolism in Young Adults • Magnetic resonance spectroscopy (MRS) is a neuroimaging modality useful in detecting changes in metabolic activity in the brain • MRS studies in young adults lead-exposed as children reveal dose-related changes in: o Gray matter, consistent with irreversible neuronal dysfunction o White matter, consistent with permanent alterations to myelin structure Cecil et al, Environ Health Perspect, 2011. 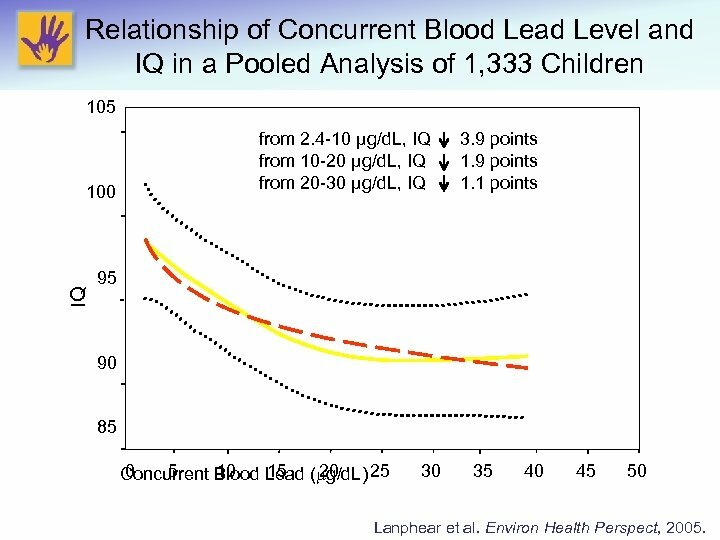 Relationship of Concurrent Blood Lead Level and IQ in a Pooled Analysis of 1, 333 Children 105 IQ 100 from 2. 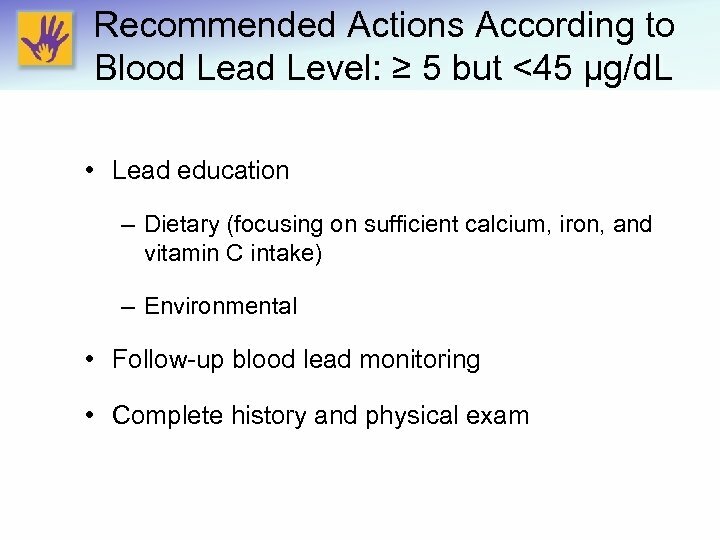 4 -10 μg/d. 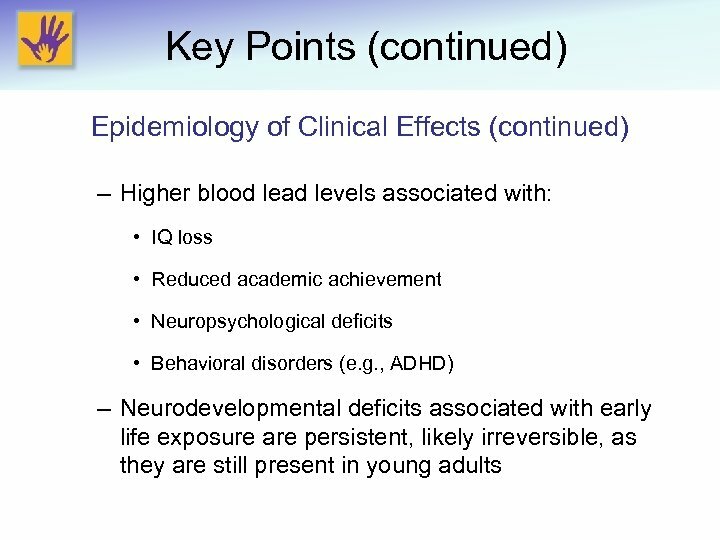 L, IQ from 10 -20 μg/d. 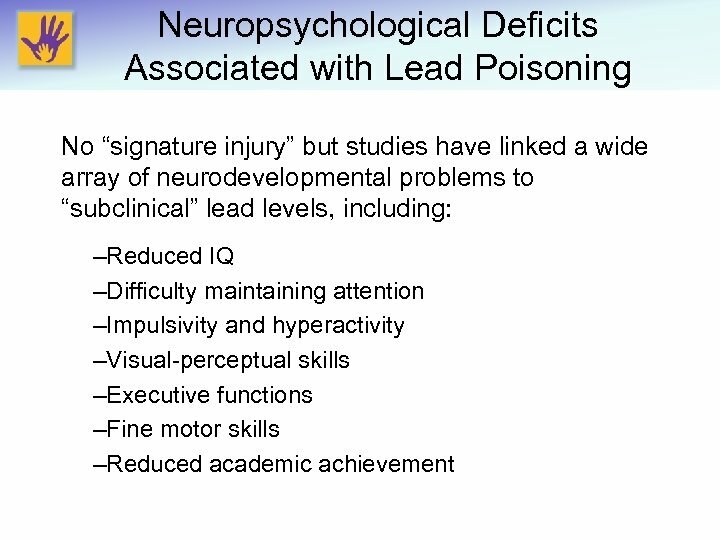 L, IQ from 20 -30 μg/d. 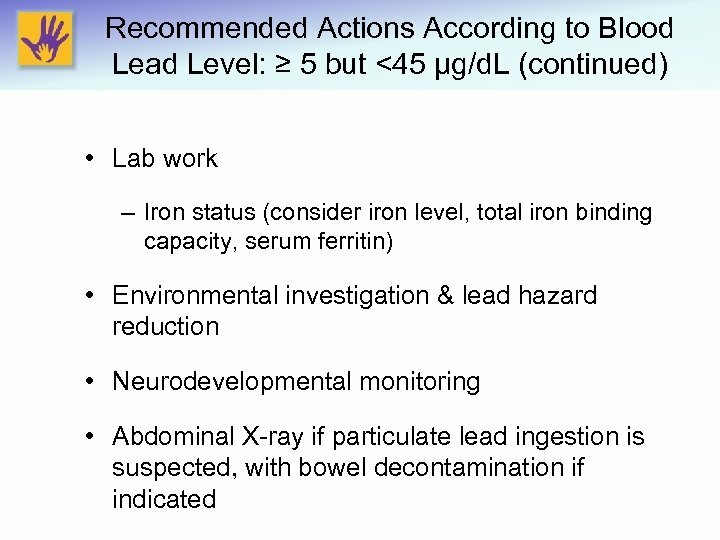 L, IQ 3. 9 points 1. 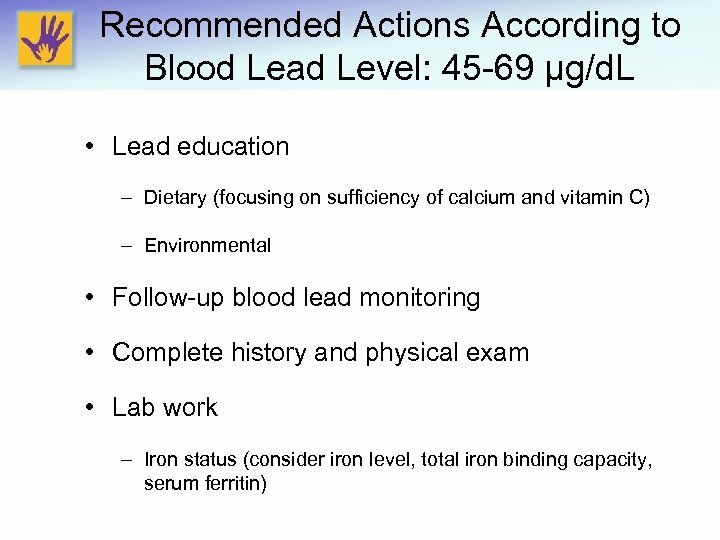 1 points 95 90 85 0 5 10 15 20 Concurrent Blood Lead ( g/d. 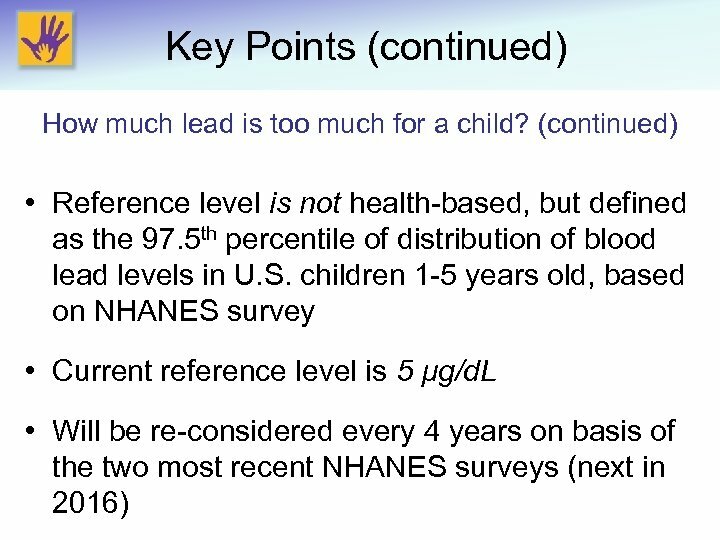 L) 25 30 35 40 45 50 Lanphear et al. 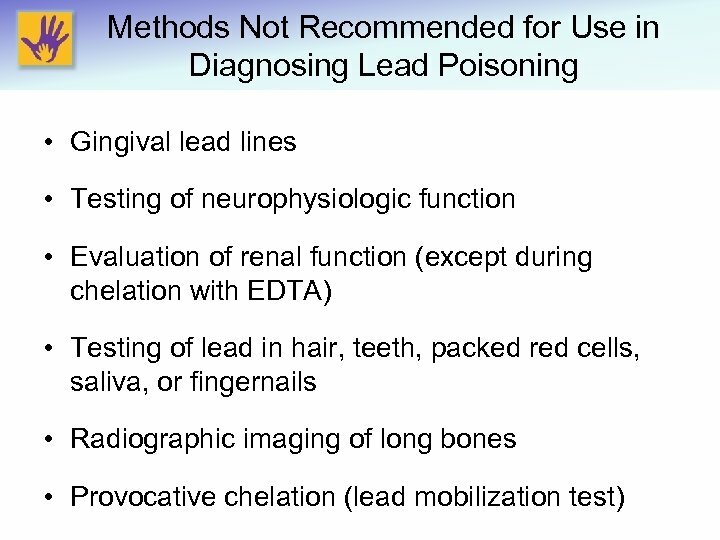 Environ Health Perspect, 2005. 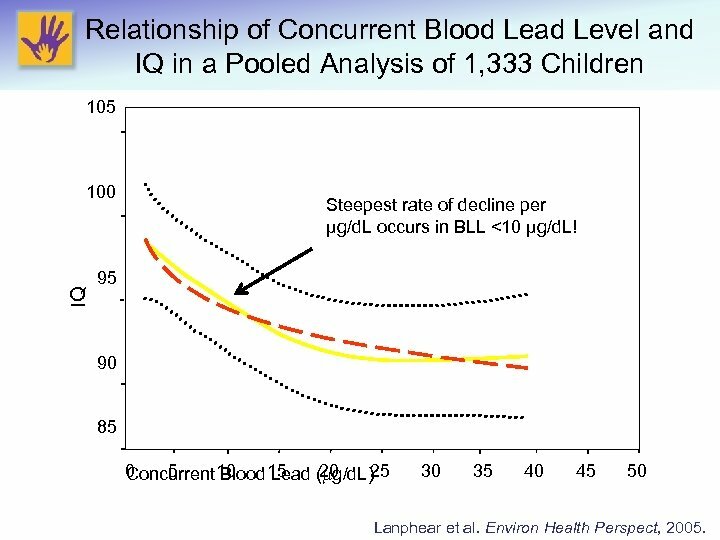 Relationship of Concurrent Blood Lead Level and IQ in a Pooled Analysis of 1, 333 Children 105 IQ 100 Steepest rate of decline per μg/d. 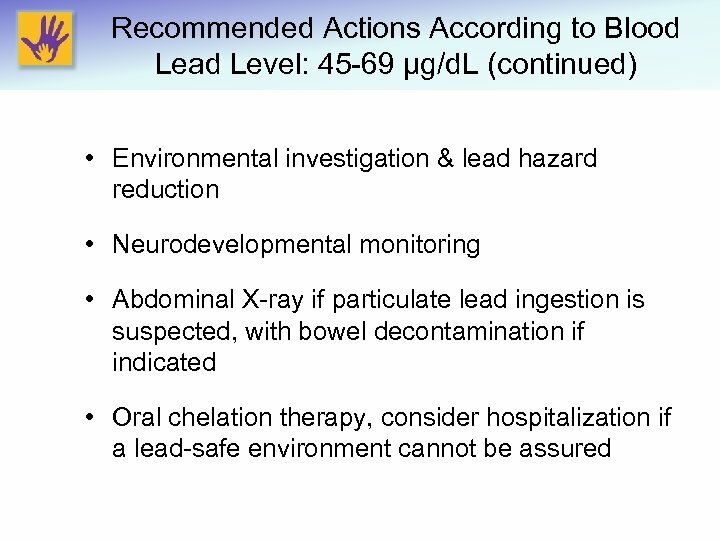 L occurs in BLL <10 µg/d. 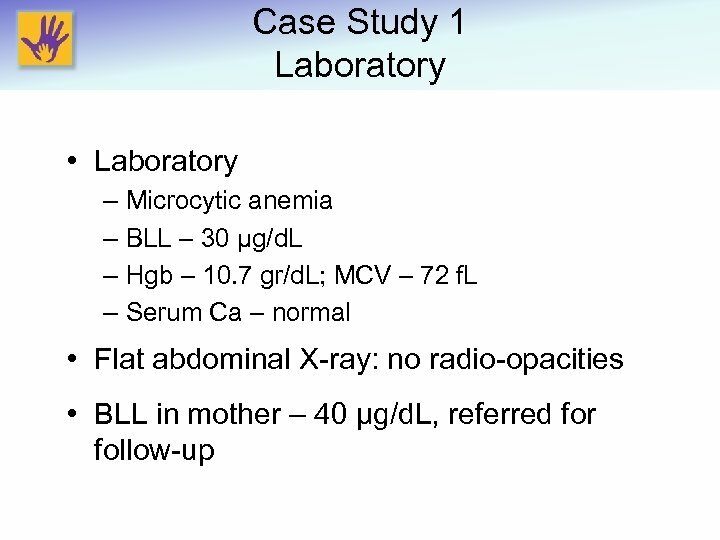 L! 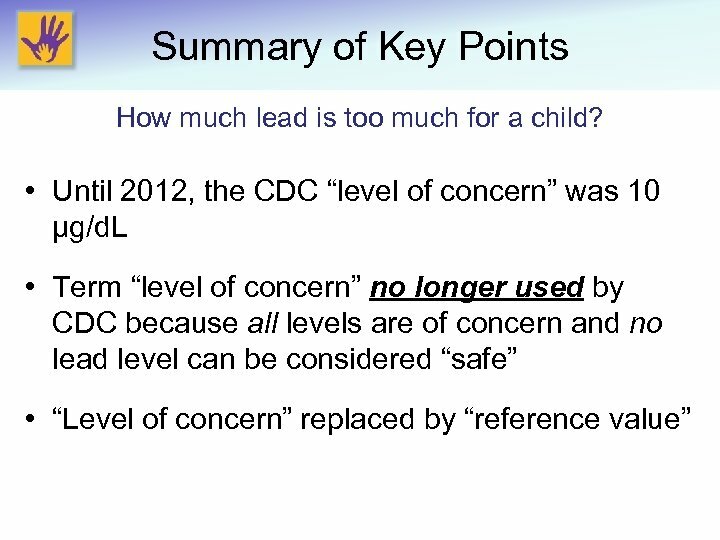 95 90 85 0 5 20 Concurrent 10 Blood 15 Lead ( g/d. 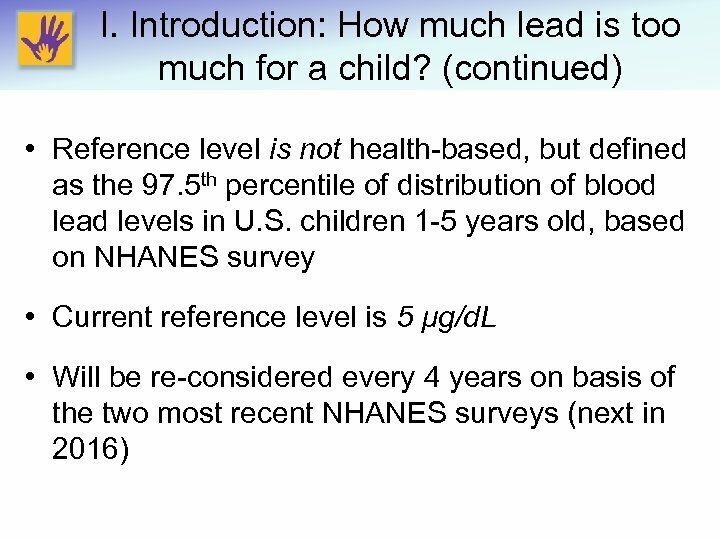 L)25 30 35 40 45 50 Lanphear et al. 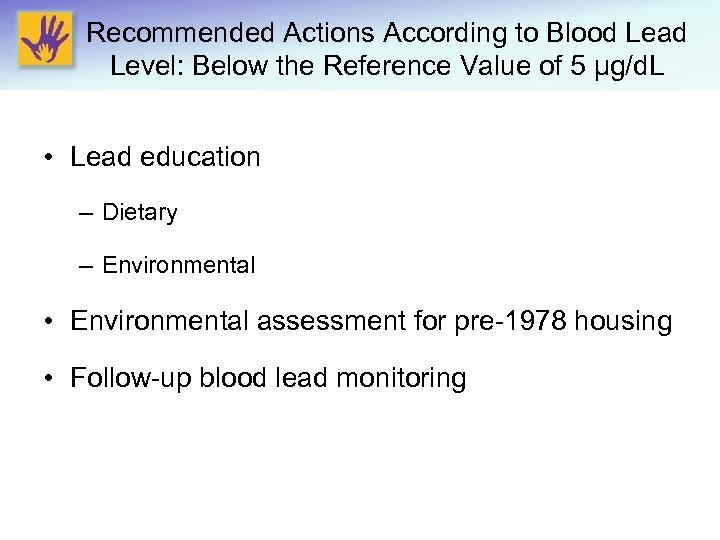 Environ Health Perspect, 2005. 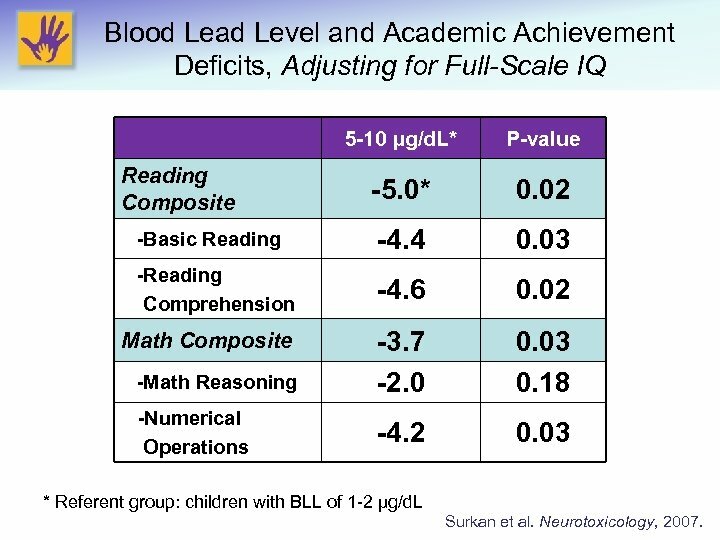 Blood Lead Level and Academic Achievement Deficits, Adjusting for Full-Scale IQ 5 -10 µg/d. 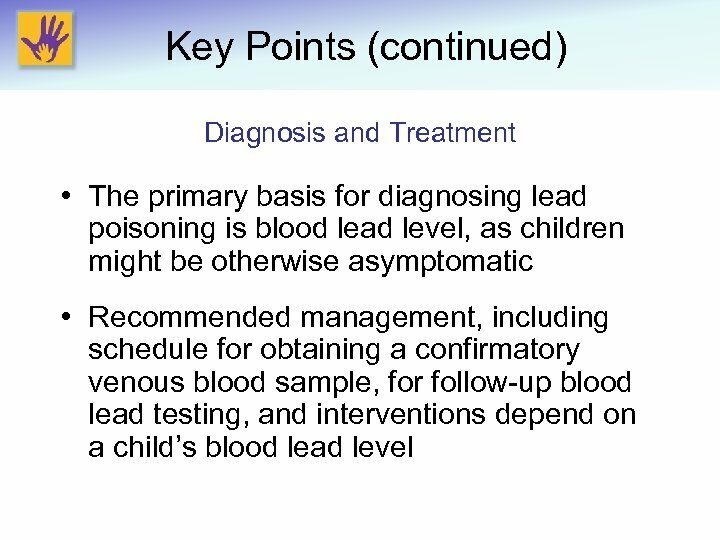 L* Reading Composite -Basic Reading -Reading Comprehension Math Composite -Math Reasoning -Numerical Operations P-value -5. 0* 0. 02 -4. 4 0. 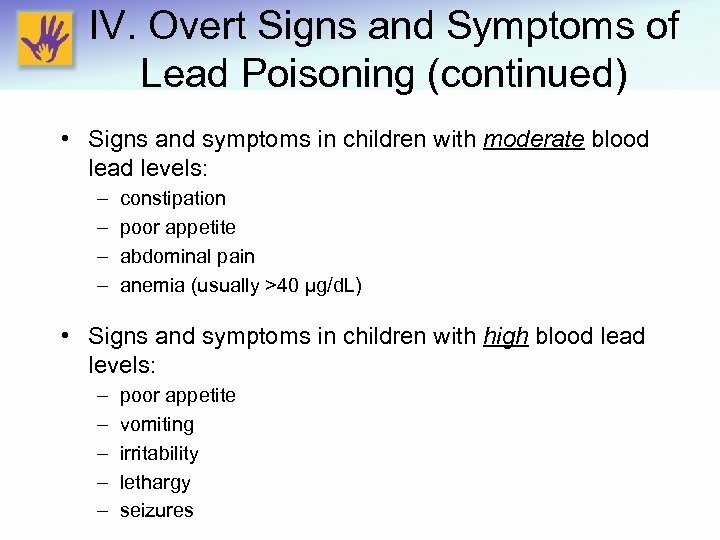 03 -4. 6 0. 02 -3. 7 -2. 0 0. 03 0. 18 -4. 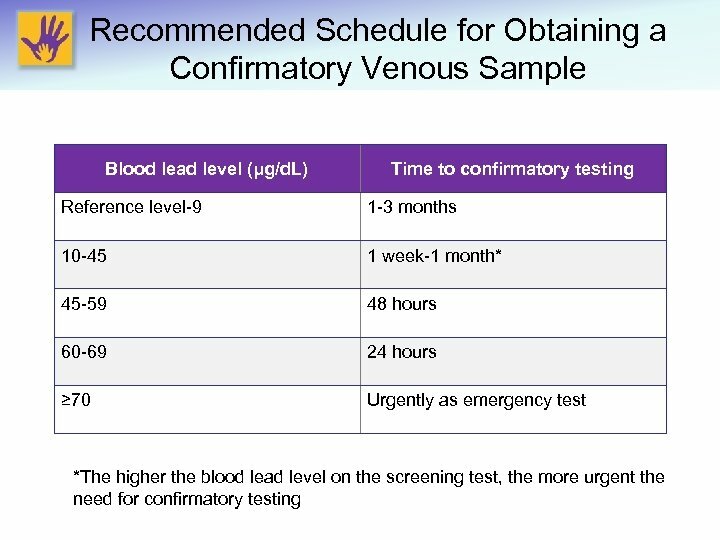 2 0. 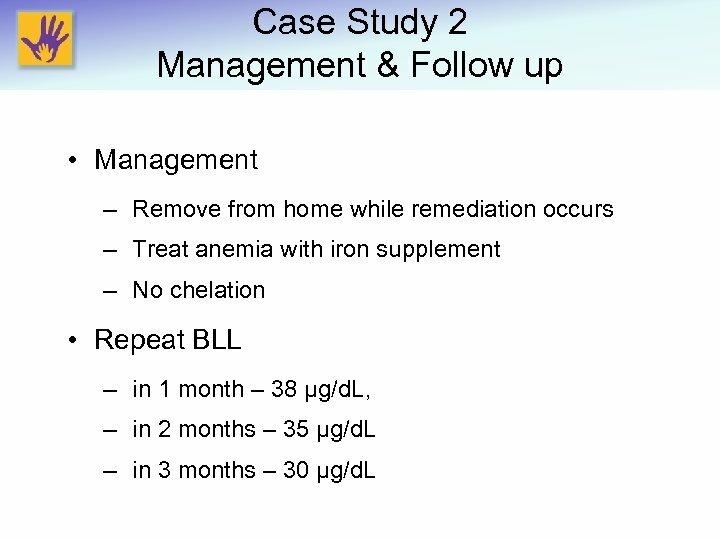 03 * Referent group: children with BLL of 1 -2 µg/d. 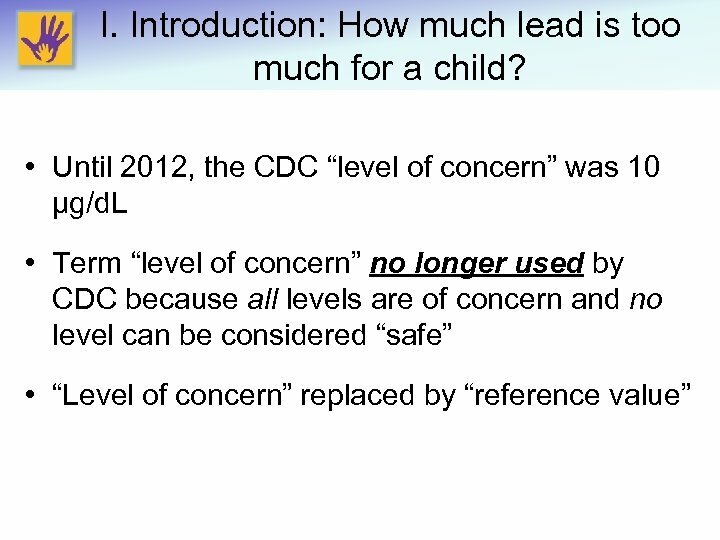 L Surkan et al. 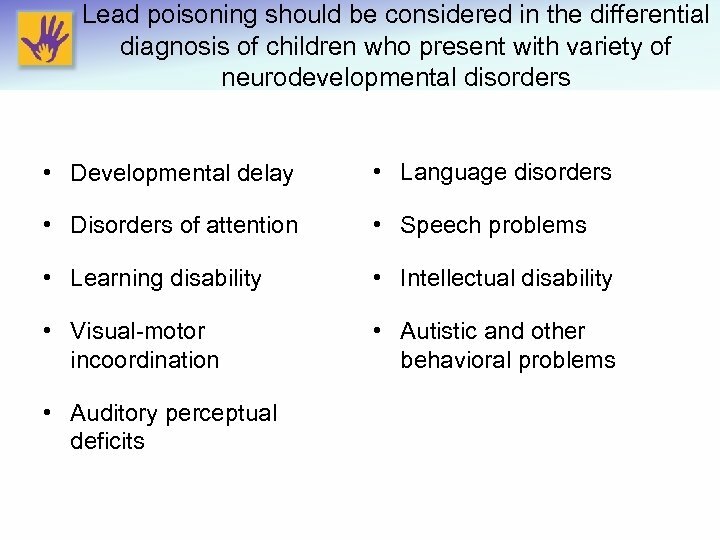 Neurotoxicology, 2007. 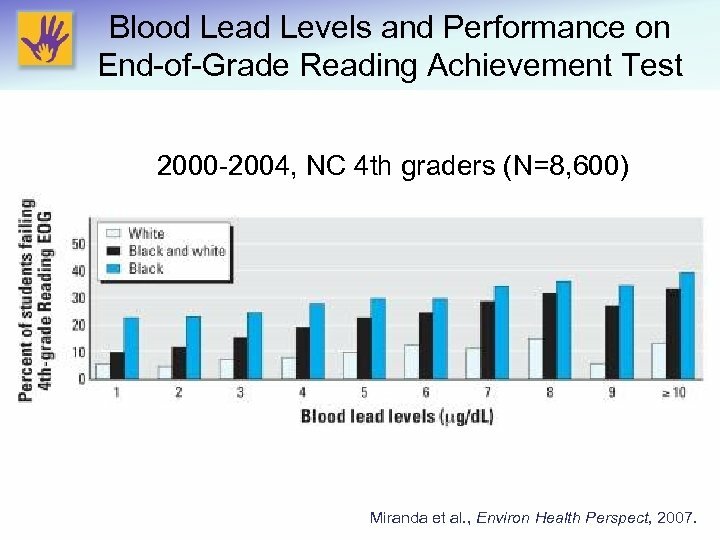 Blood Lead Levels and Performance on End-of-Grade Reading Achievement Test 2000 -2004, NC 4 th graders (N=8, 600) Miranda et al. 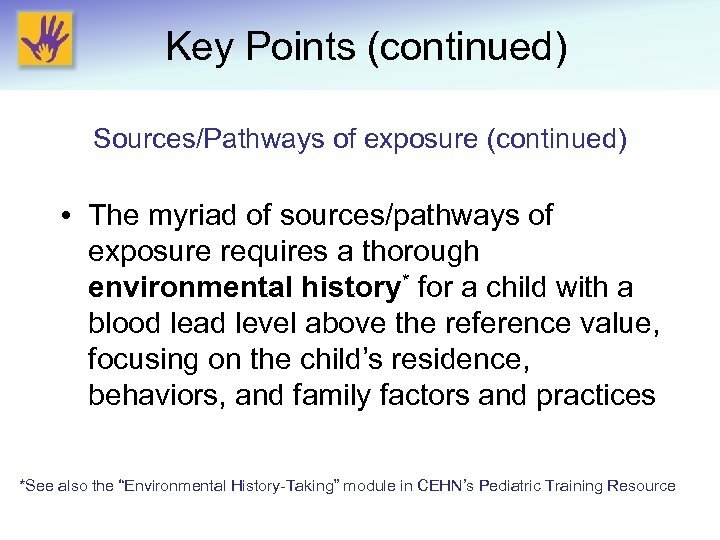 , Environ Health Perspect, 2007. 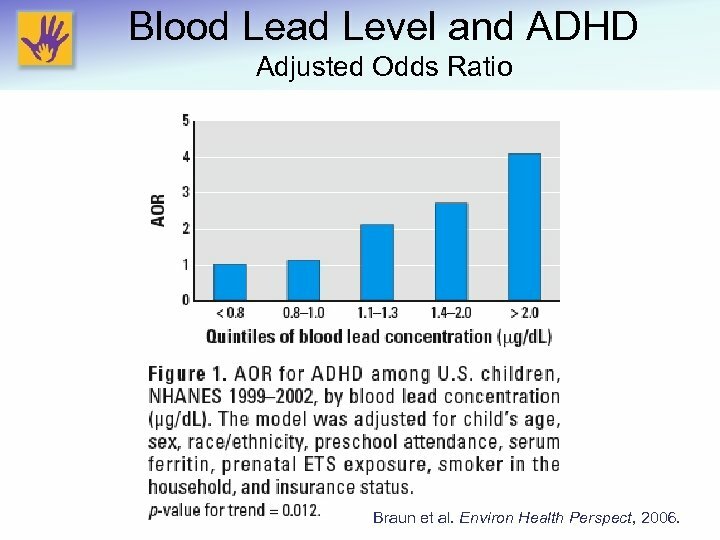 Blood Lead Level and ADHD Adjusted Odds Ratio Braun et al. 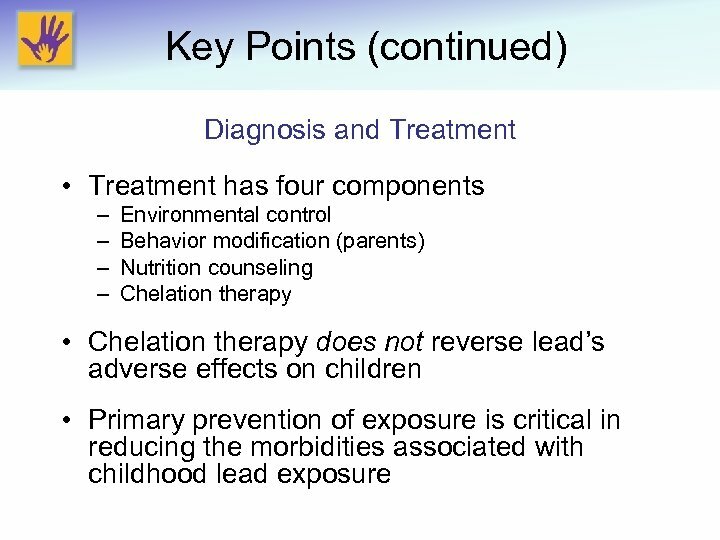 Environ Health Perspect, 2006. 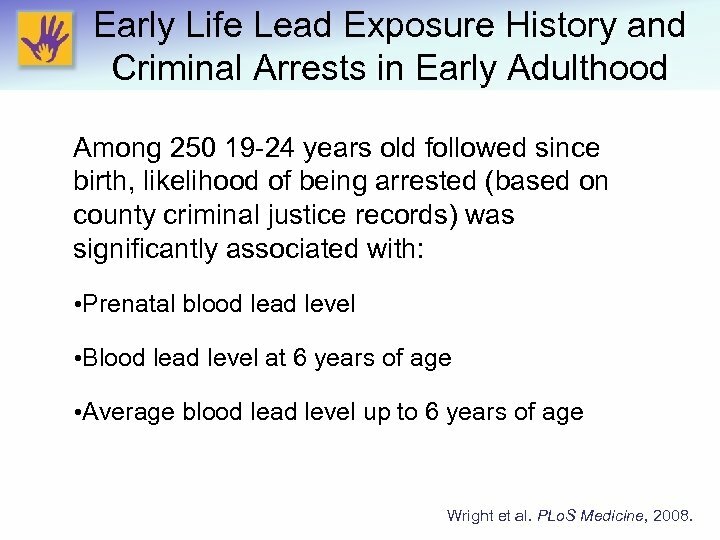 Early Life Lead Exposure History and Criminal Arrests in Early Adulthood Among 250 19 -24 years old followed since birth, likelihood of being arrested (based on county criminal justice records) was significantly associated with: • Prenatal blood lead level • Blood lead level at 6 years of age • Average blood lead level up to 6 years of age Wright et al. 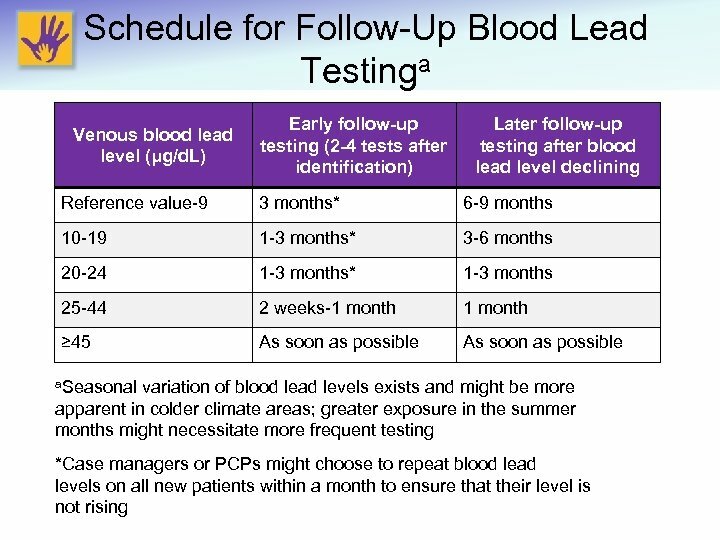 PLo. 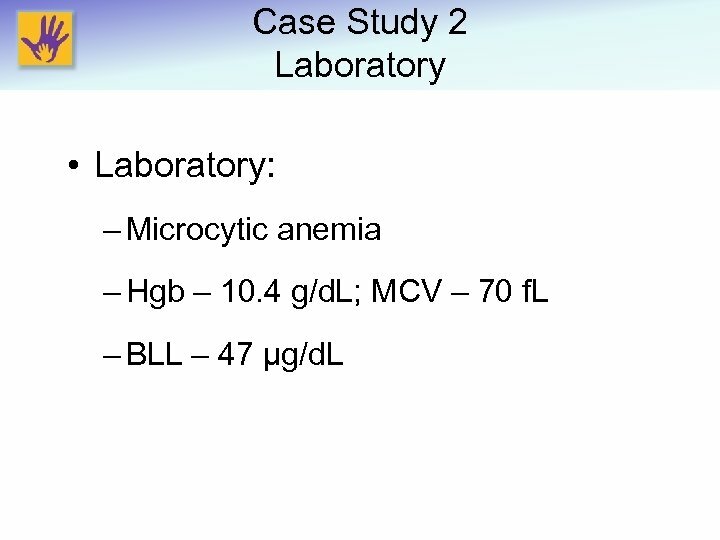 S Medicine, 2008. 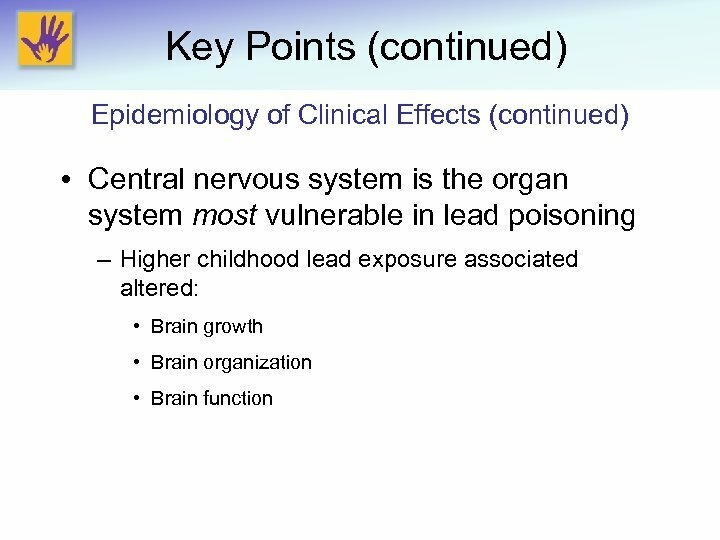 Lead and Neurodegeneration? 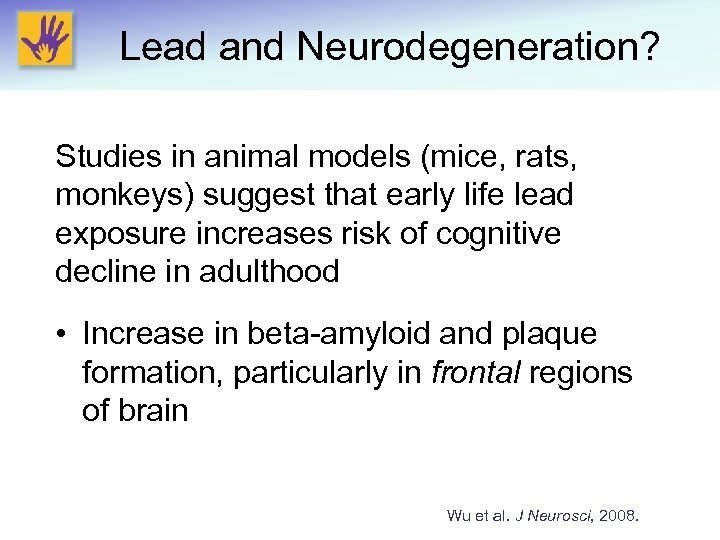 Studies in animal models (mice, rats, monkeys) suggest that early life lead exposure increases risk of cognitive decline in adulthood • Increase in beta-amyloid and plaque formation, particularly in frontal regions of brain Wu et al. 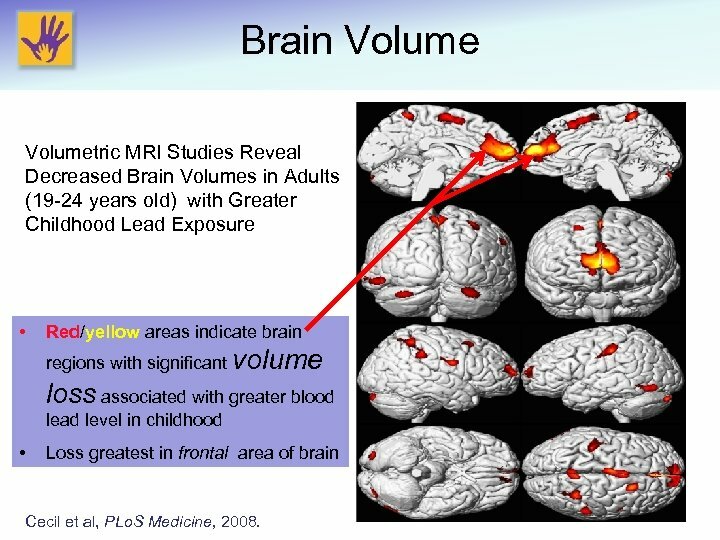 J Neurosci, 2008. 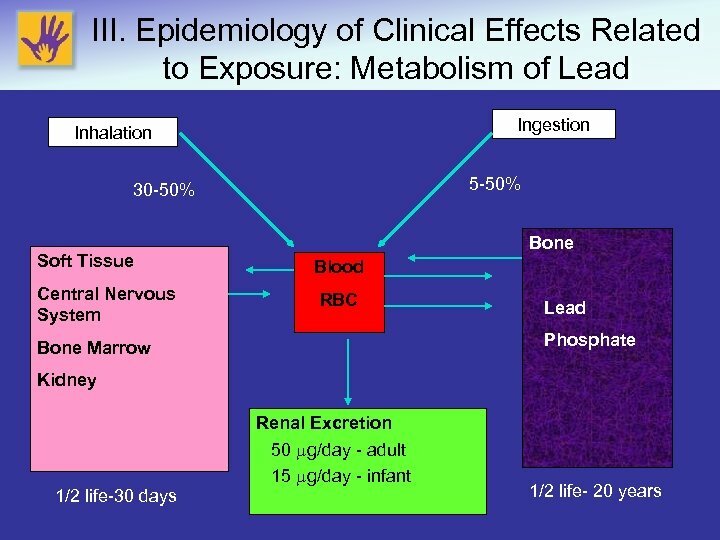 Are Cognitive Effects of Lead Reversible if Blood Lead Level is Decreased? 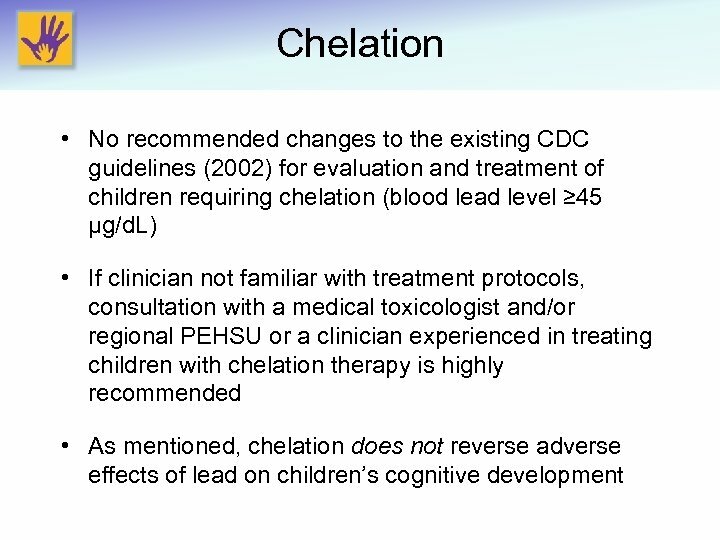 • Port Pirie Cohort Study (Australia) analyzed blood lead change vs. cognitive change in childhood, up to age 11 -13 years • Results: no significant association between blood lead reduction and improved cognitive scores • Treatment of Lead-Exposed Children(TLC) study • The only randomized clinical trial of chelation of children • Chelation of children with baseline blood lead levels of 20 -44 μg/d. 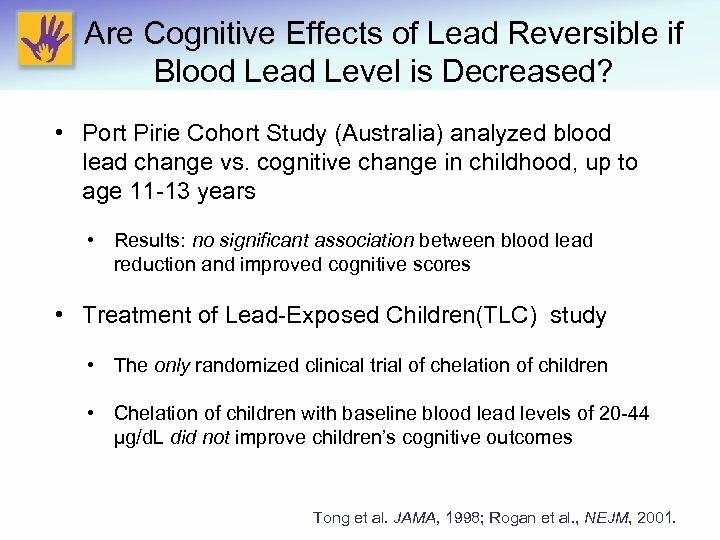 L did not improve children’s cognitive outcomes Tong et al. 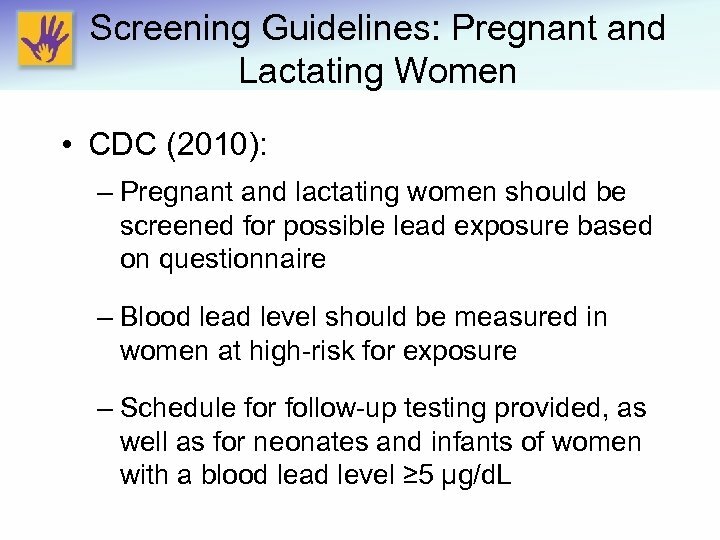 JAMA, 1998; Rogan et al. 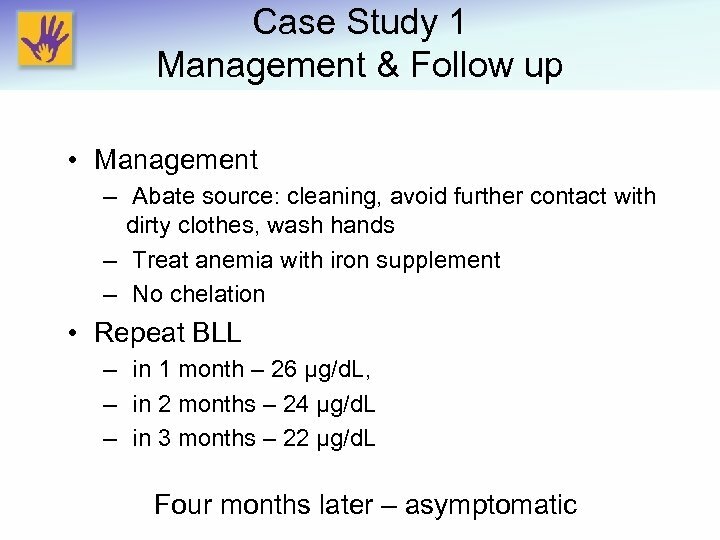 , NEJM, 2001. 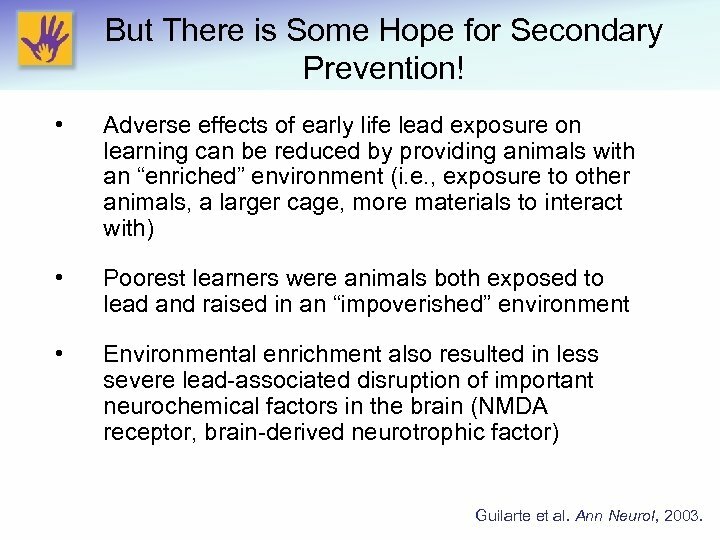 But There is Some Hope for Secondary Prevention! 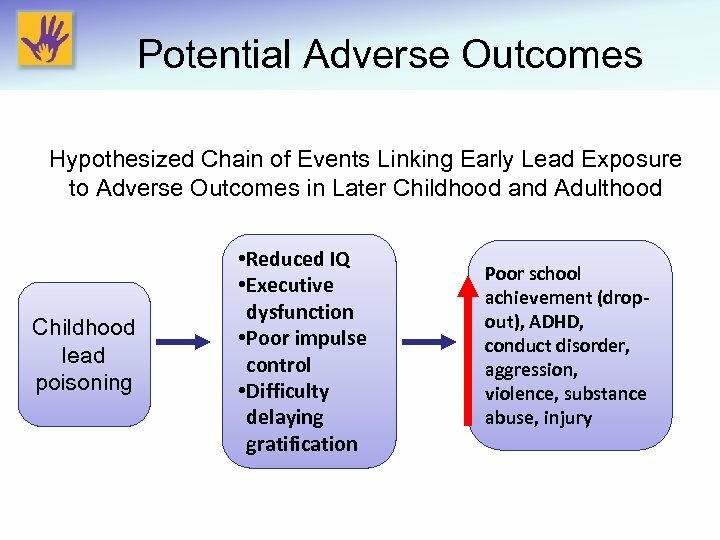 • Adverse effects of early life lead exposure on learning can be reduced by providing animals with an “enriched” environment (i. e. , exposure to other animals, a larger cage, more materials to interact with) • Poorest learners were animals both exposed to lead and raised in an “impoverished” environment • Environmental enrichment also resulted in less severe lead-associated disruption of important neurochemical factors in the brain (NMDA receptor, brain-derived neurotrophic factor) Guilarte et al. Ann Neurol, 2003. 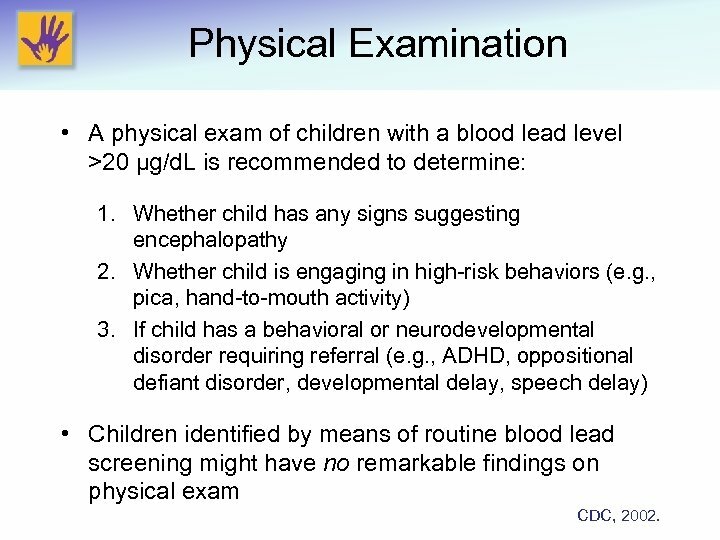 Physical Examination • A physical exam of children with a blood lead level >20 µg/d. 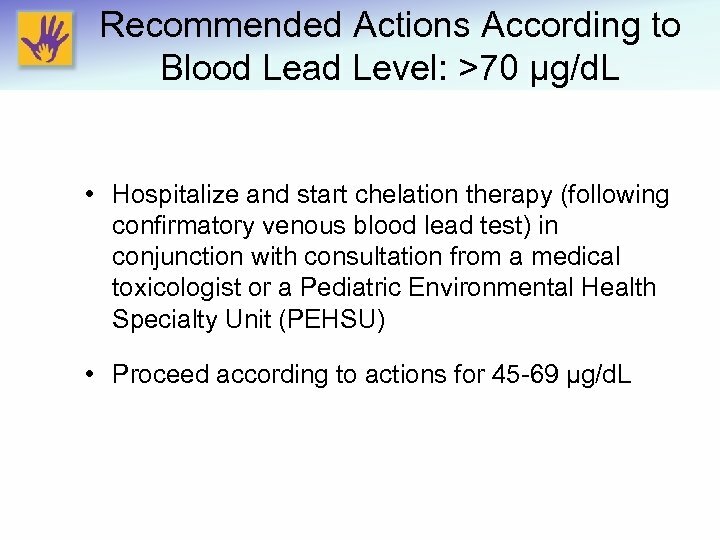 L is recommended to determine: 1. 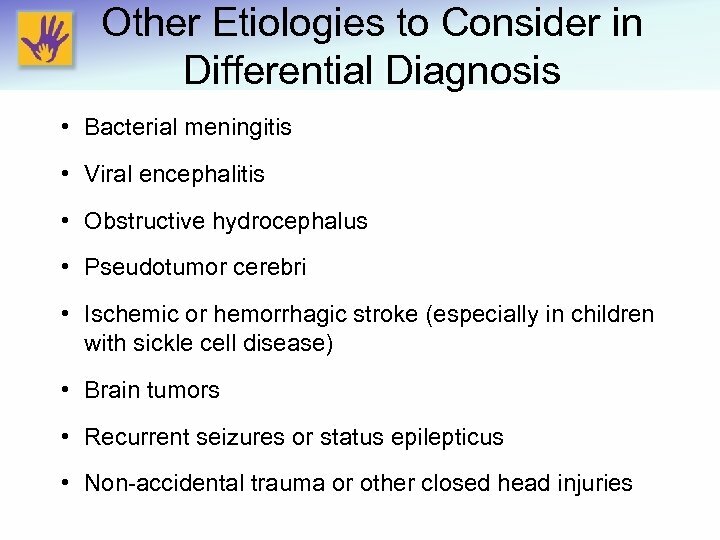 Whether child has any signs suggesting encephalopathy 2. 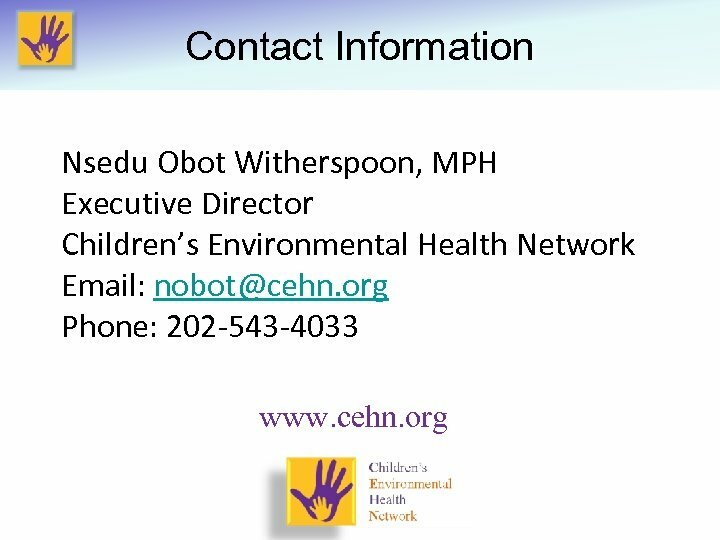 Whether child is engaging in high-risk behaviors (e. g. , pica, hand-to-mouth activity) 3. 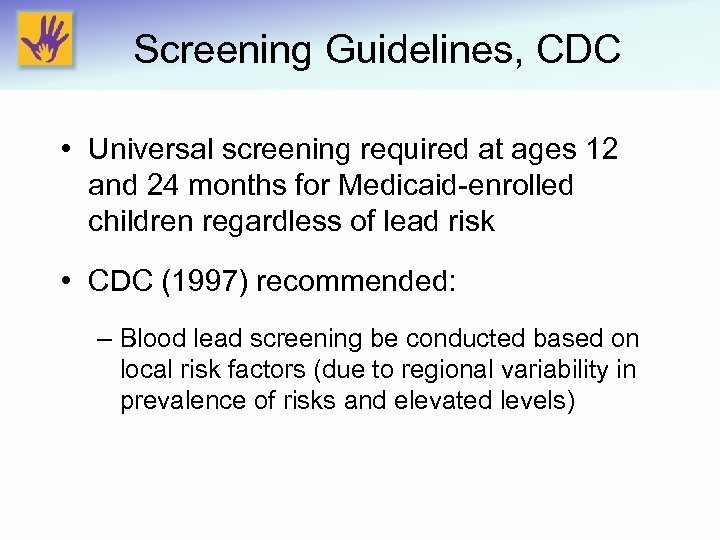 If child has a behavioral or neurodevelopmental disorder requiring referral (e. g. , ADHD, oppositional defiant disorder, developmental delay, speech delay) • Children identified by means of routine blood lead screening might have no remarkable findings on physical exam CDC, 2002. 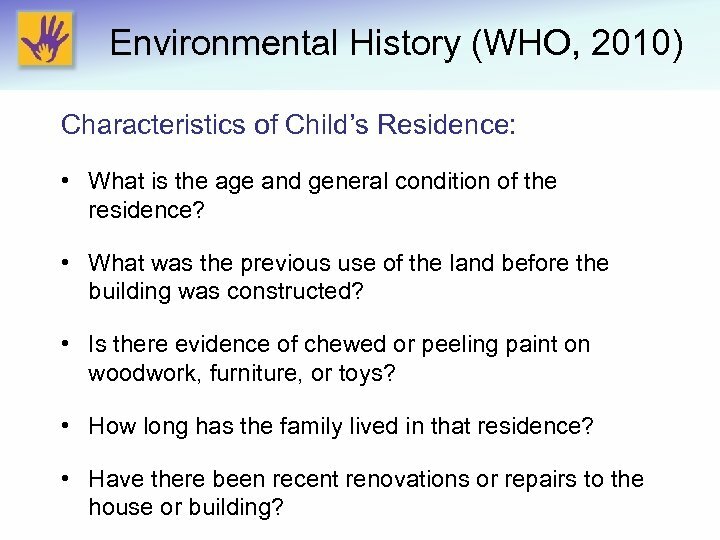 Environmental History (WHO, 2010) Characteristics of Child’s Residence: • What is the age and general condition of the residence? • What was the previous use of the land before the building was constructed? 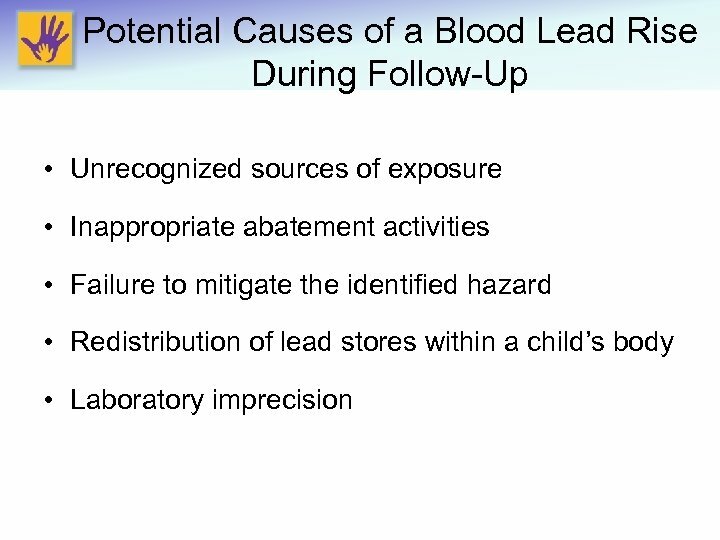 • Is there evidence of chewed or peeling paint on woodwork, furniture, or toys? 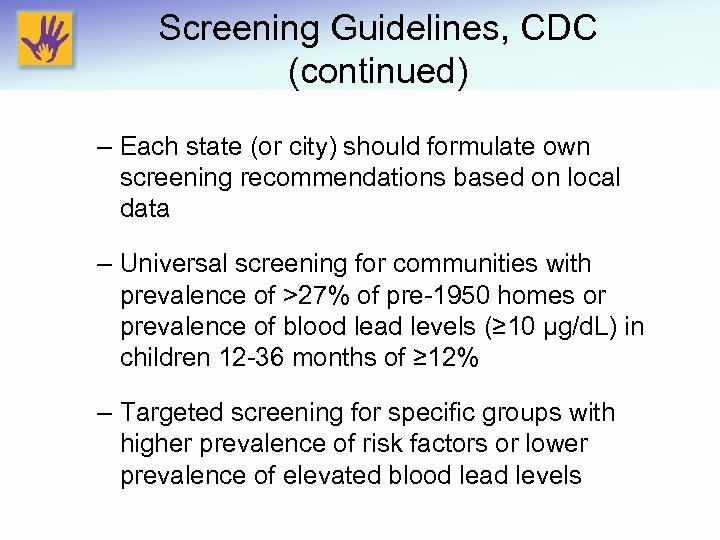 • How long has the family lived in that residence? 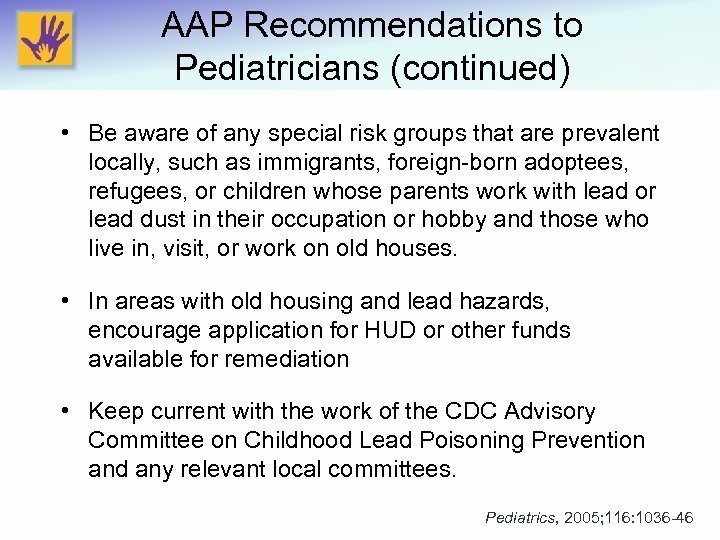 • Have there been recent renovations or repairs to the house or building? 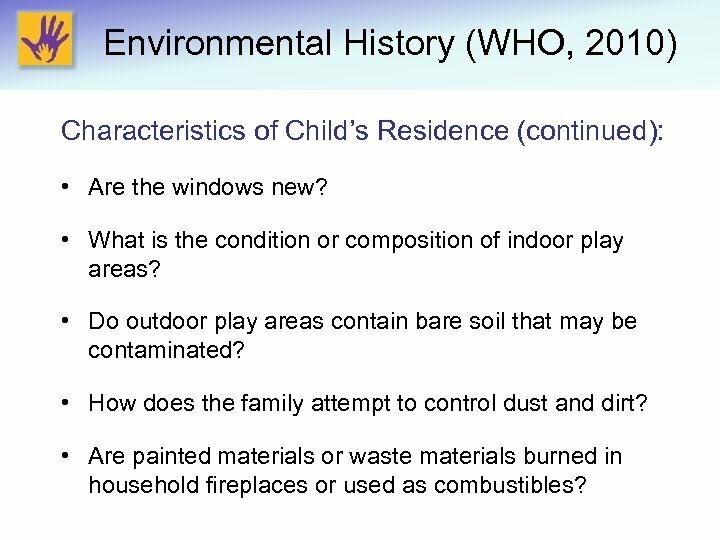 Environmental History (WHO, 2010) Characteristics of Child’s Residence (continued): • Are the windows new? 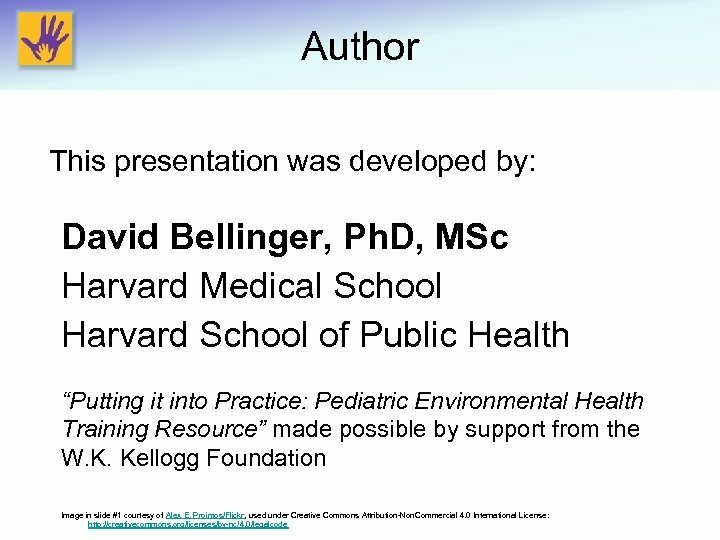 • What is the condition or composition of indoor play areas? 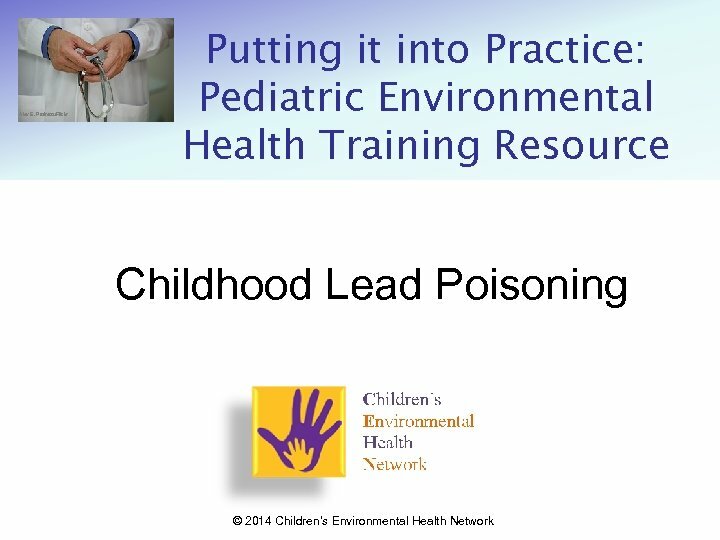 • Do outdoor play areas contain bare soil that may be contaminated? 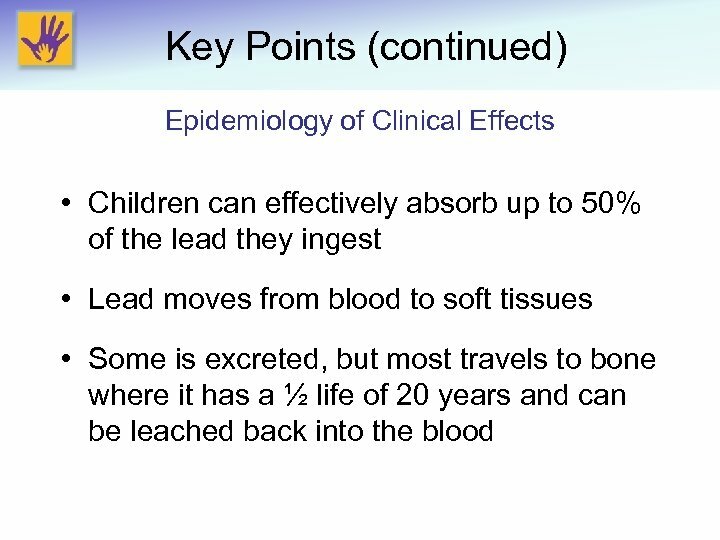 • How does the family attempt to control dust and dirt? 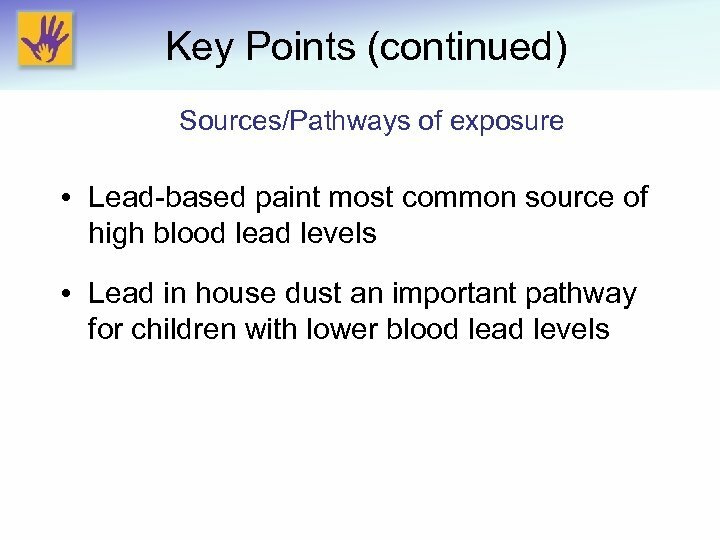 • Are painted materials or waste materials burned in household fireplaces or used as combustibles? 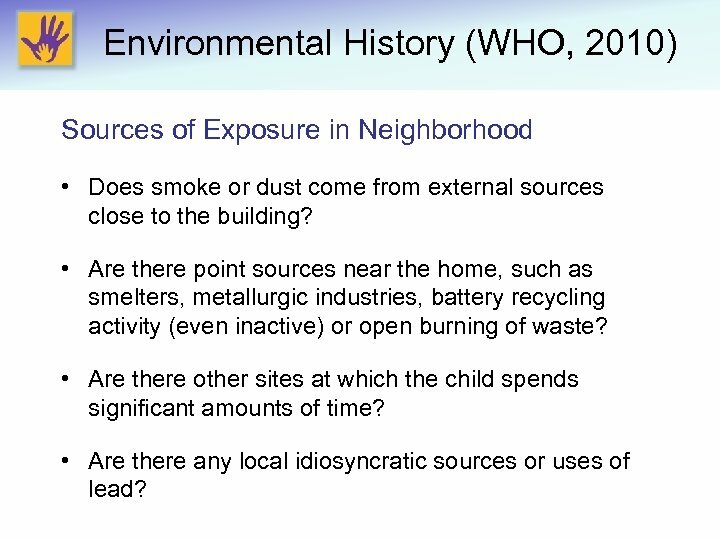 Environmental History (WHO, 2010) Sources of Exposure in Neighborhood • Does smoke or dust come from external sources close to the building? 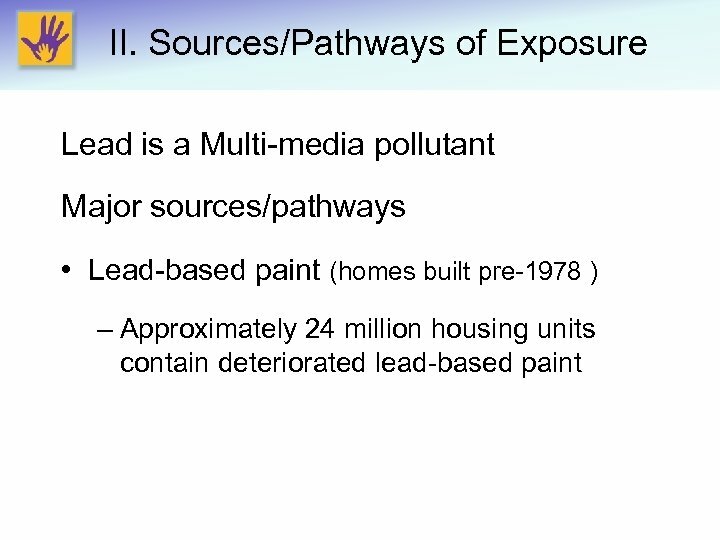 • Are there point sources near the home, such as smelters, metallurgic industries, battery recycling activity (even inactive) or open burning of waste? 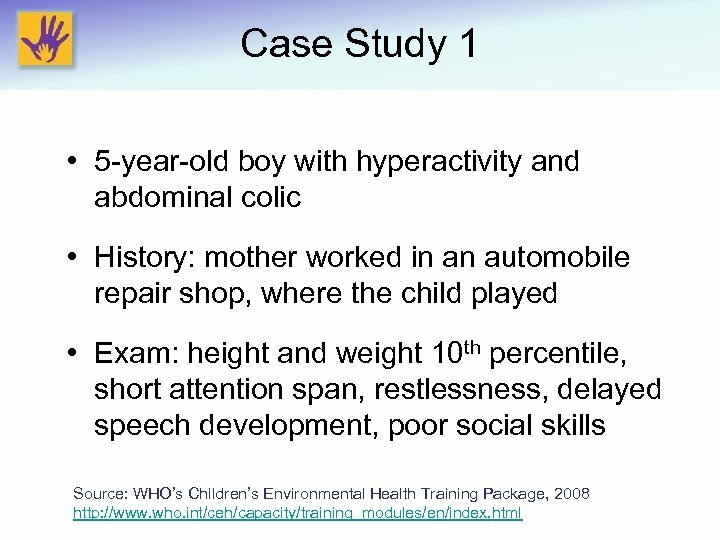 • Are there other sites at which the child spends significant amounts of time? 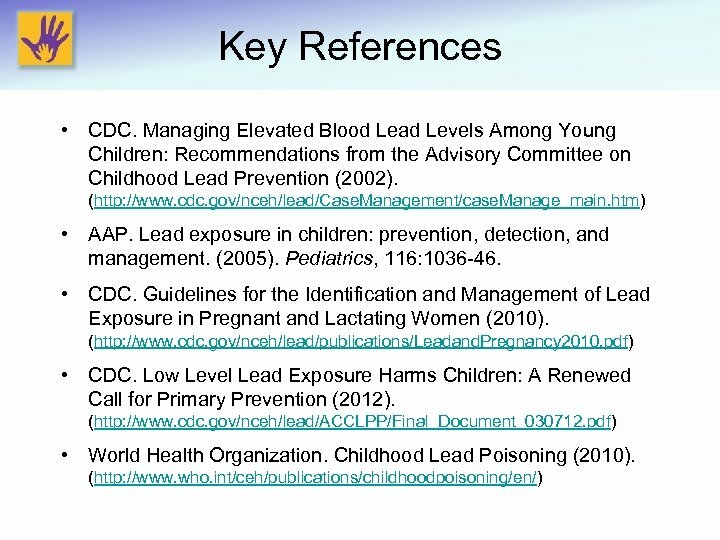 • Are there any local idiosyncratic sources or uses of lead? 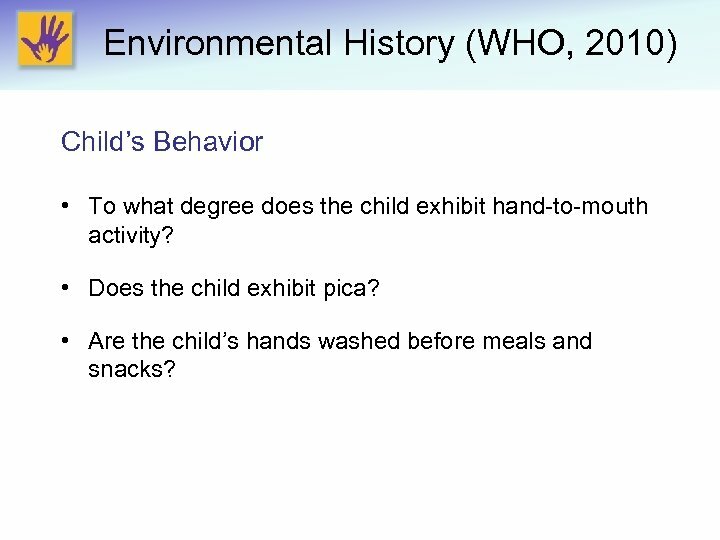 Environmental History (WHO, 2010) Child’s Behavior • To what degree does the child exhibit hand-to-mouth activity? 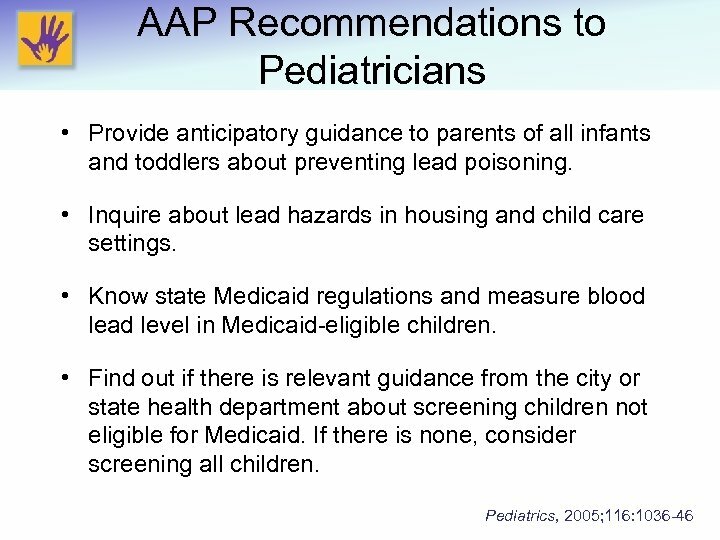 • Does the child exhibit pica? 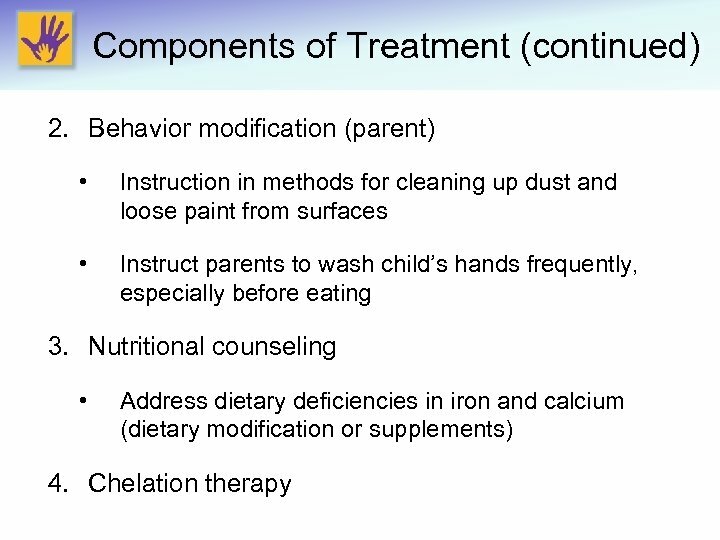 • Are the child’s hands washed before meals and snacks? 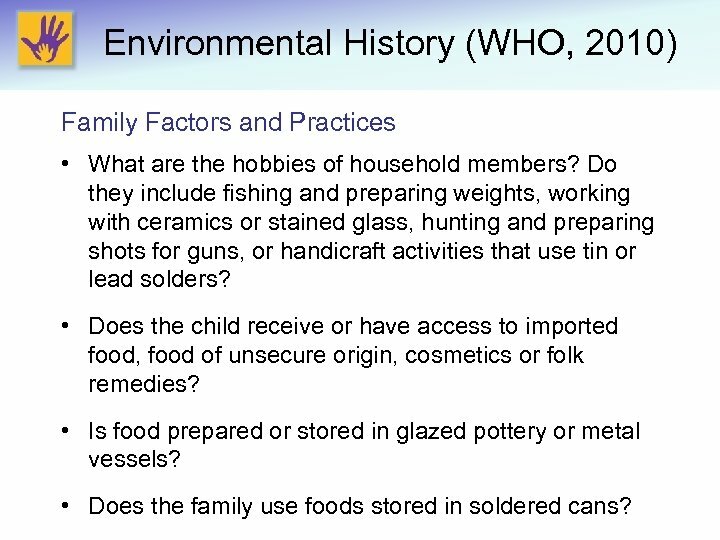 Environmental History (WHO, 2010) Family Factors and Practices • What are the hobbies of household members? 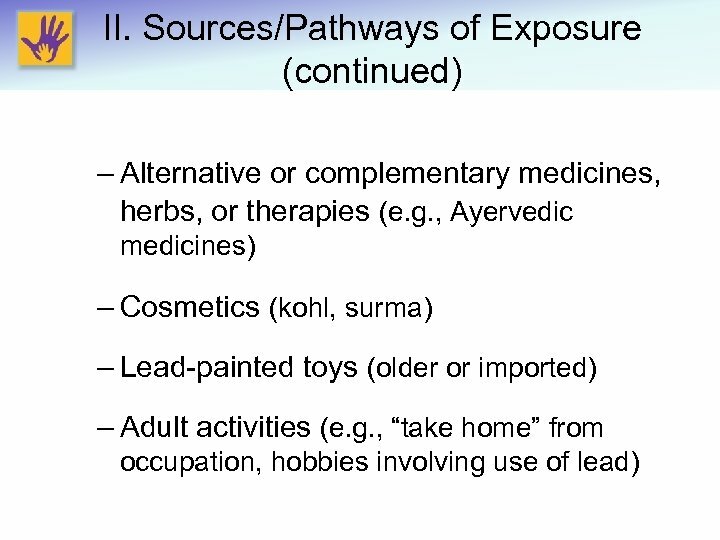 Do they include fishing and preparing weights, working with ceramics or stained glass, hunting and preparing shots for guns, or handicraft activities that use tin or lead solders? 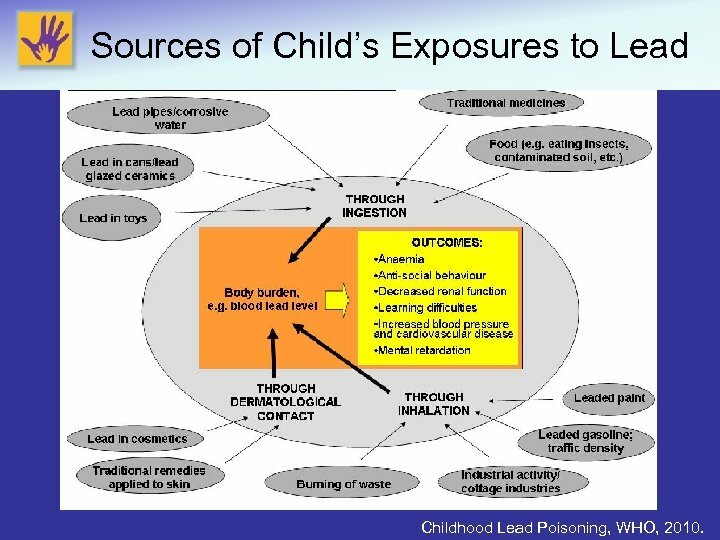 • Does the child receive or have access to imported food, food of unsecure origin, cosmetics or folk remedies? 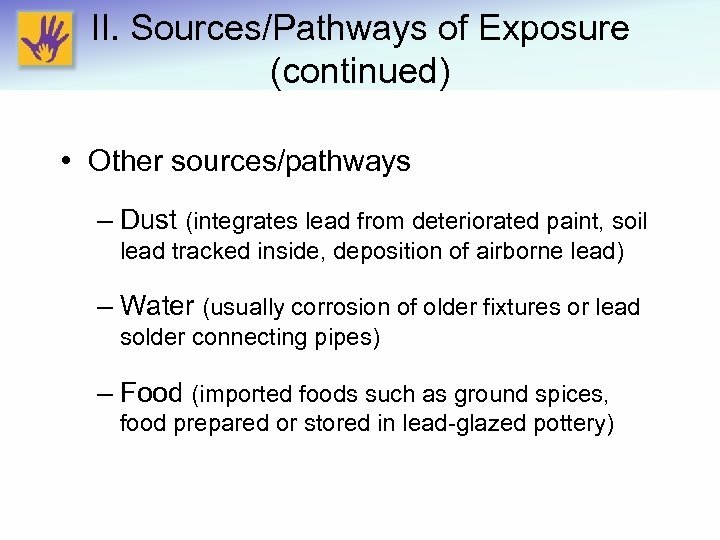 • Is food prepared or stored in glazed pottery or metal vessels? 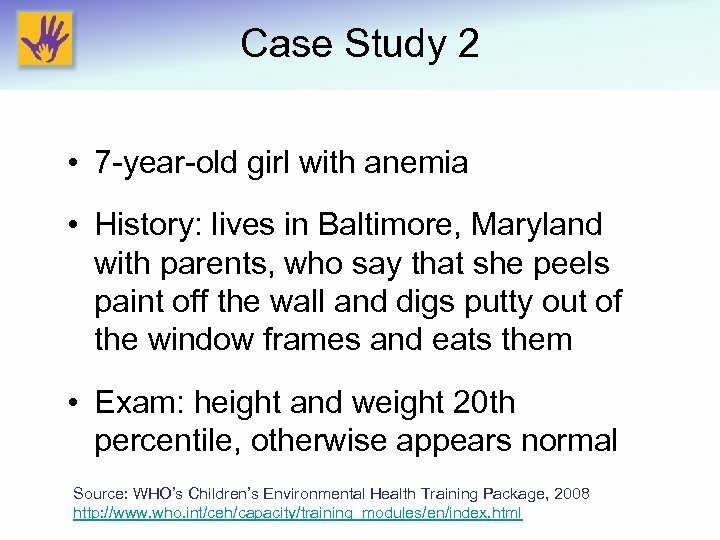 • Does the family use foods stored in soldered cans?